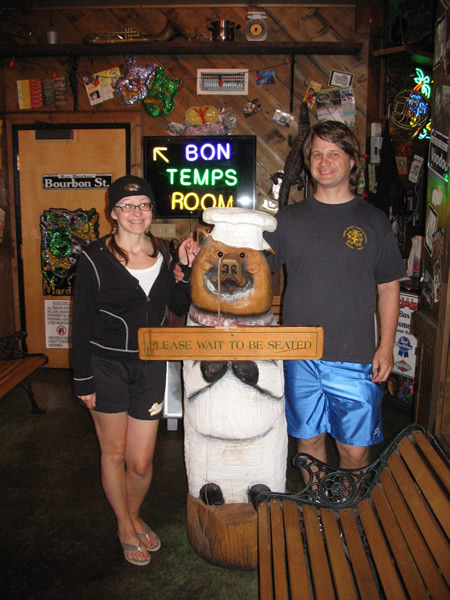 This is the fifth post in a series of our trip to Columbia Missouri. To read what Padre, Panda Bear, and Meerkat were up to in our absence, check out the Furry Bambinos blog. After our excursion on the Mizzou campus on Thursday, we headed back to Chris & Patty’s house so Bruiser could go out for a stroll and we could see their house in the daylight. Inside, it seems Cinnamon has forgiven Sue for the long drive out to Missouri. 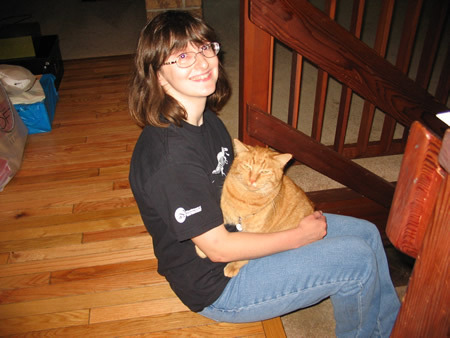 Cinnamon tended to be more of “the cat ambassador”, eager to explore and say hello to everyone. Toast was a little more reserved. 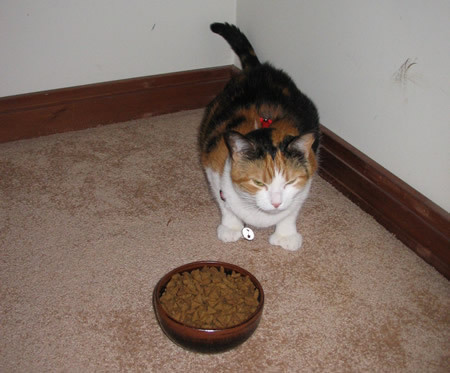 She stayed hidden in one of the bedrooms for quite a while before venturing out to explore the large house. Note the extra toes on her front paws! She looks like she has thumbs! So now, we go on a brief house tour of Chris & Patty’s new home in Columbia! Here is the kitchen. 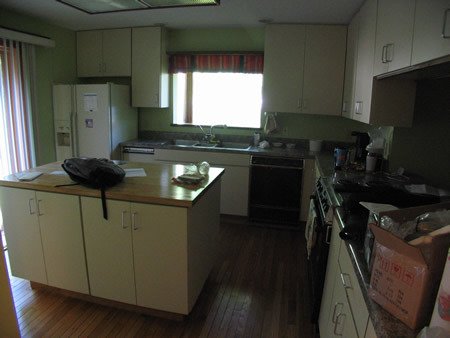 Lots of counter space, and lots of kitchen cabinets. This is taken from the main entrance off the foyer. 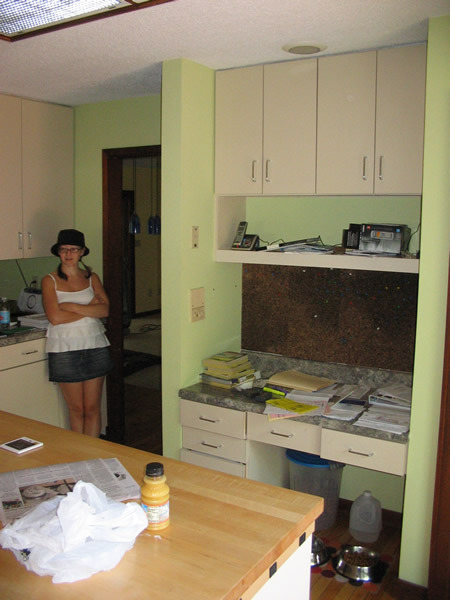 To the right is a counter that opens into the dining room area. The refrigerator is on the left side of the photograph. This is the view from the refrigerator looking back at the main entranceway into the kitchen. That area with the brown wall is a writing counter / workspace with cork board. 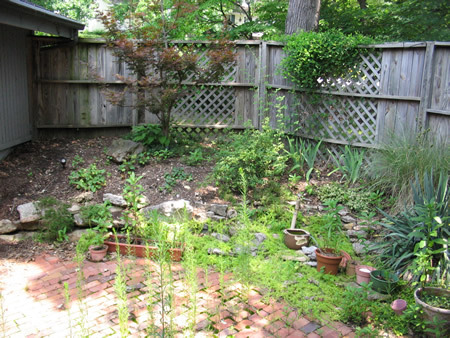 The kitchen looks out on this little fenced in area that’s partly a garden, and partly a small patio. Chris envisions setting a grill out in this area since it’s right off the kitchen. It’s also a convenient holding pen for Bruiser! 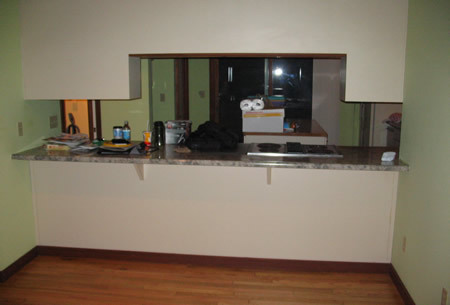 The following is a view of the kitchen from the dining room. People could sit at stools on this side and look into the kitchen. The black area in the middle of the photo (that shows the reflection of the camera flash) is actually the doors out to the little patio pictured above. We took the picture below on our first visit to the house, after it was dark, but have moved it sequentially for clarity. For the photo below, I simply turned around 180 degrees from the photo above. This room will be the dining room, directly accessible from the kitchen! The dining area has a small fireplace (to the right in the photo). 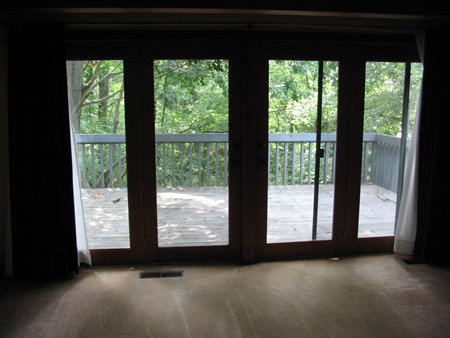 This is the view out of the dining room doors onto the small deck. There’s a lamp on a pole in the middle of the photograph, and beyond that, a small fenced in area which was for the previous owner’s dog. Patty & Chris may or may not use that area for Bruiser at sometime. Bruiser is really more of an indoor dog. This is a view from that pole lamp looking back at the doors to the dining room. Back in the house now. This is the main living room area on the first floor. This photo was taken from the top of the stairwell that leads to the basement. Basically, I’m at the entrance to the kitchen, with my back to the kitchen looking into the room. Notice the skylights above! The blue hanging objects are lamp shades that the previous owner had over a dining table. The living room has its own porch, too! This is what it looks like through the doors. 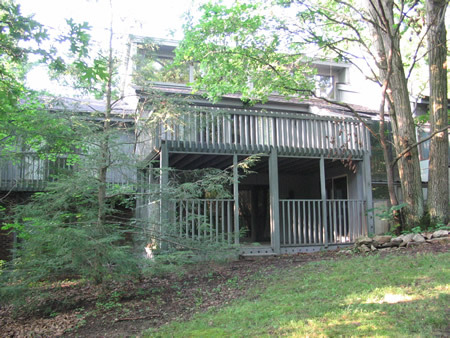 This is another view of that porch off the living room. 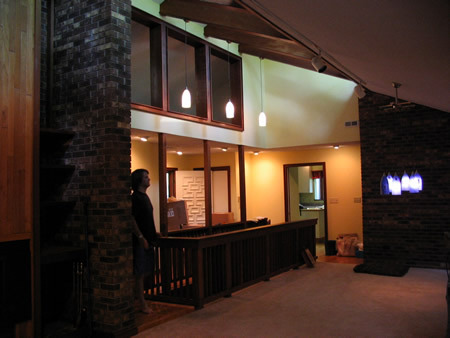 Here, I am standing at those doors to the porch, looking at the sky high fireplace! Sue is in position to show the relative scale of the height of the wall. Considering Sue is just over 5 feet tall, you’re looking at about 15 feet on the vertical here. The following is taken from the back corner of the living room area. 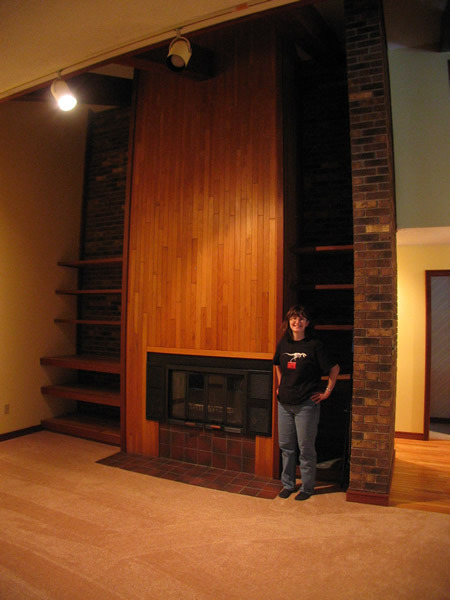 The fireplace is to the left. The doors to the patio are to the right. The “fenced” area at the center is the stairwell to the lower level. The door to the kitchen is just right of center. The three squares near the top of the photo are the loft area that overlooks the living area space. 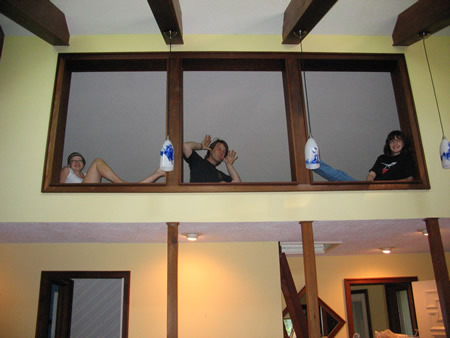 Below are Patty, Chris and Sue goofing around in the loft area. You have to climb a ladder to get up there! 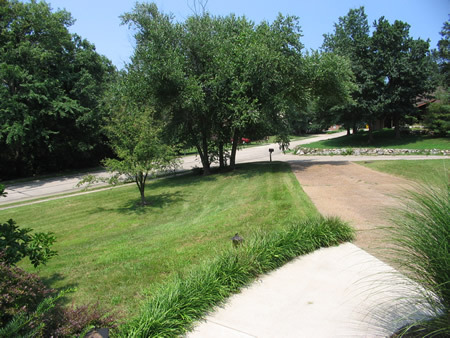 The front entrance to the house is in the lower right corner of the photo. In the lower left of the photo is a doorway to a bedroom which is painted blue. 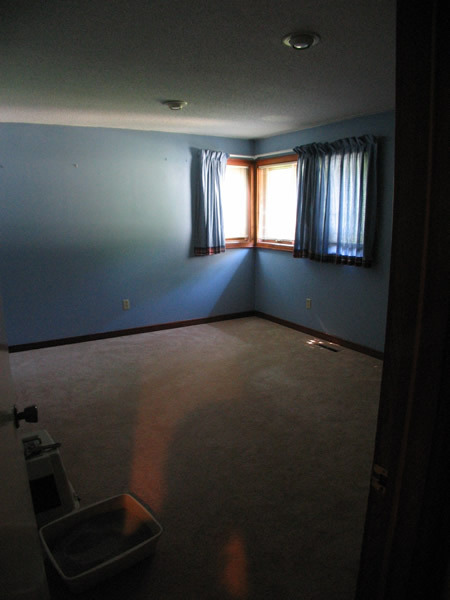 This is the blue bedroom off the living area on the main floor of the house. This bedroom has its own bathroom, too (besides the litterbox for the cats)! Continuing down the hall on the main level, we eventually come to the master bedroom. There are steps down into this lovely room with high ceilings. 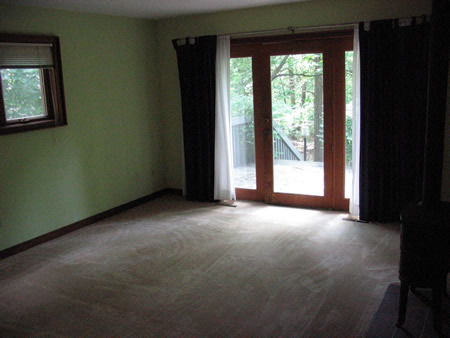 The master bedroom also has its own porch. The master bath has a shower stall and a Jacuzzi! 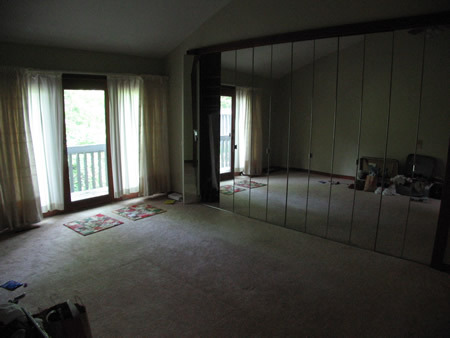 The mirrored wall is actually a wall of closet doors. Now, let’s head downstairs! So, we head back to the main entrance to the house where we can go down the main stairwell. 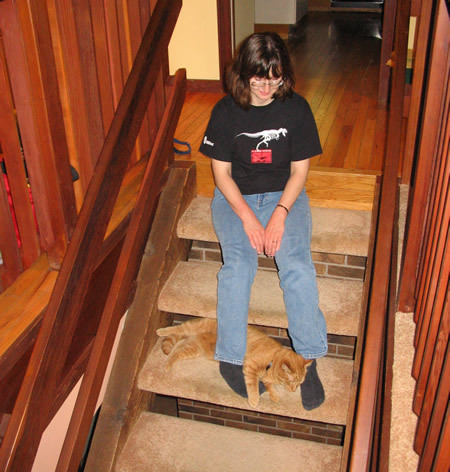 Now, Sue and Cinnamon will have to move out of the way! Here’s a view down the stairs to the lower level. Patty is standing on a small landing that’s halfway down the staircase. 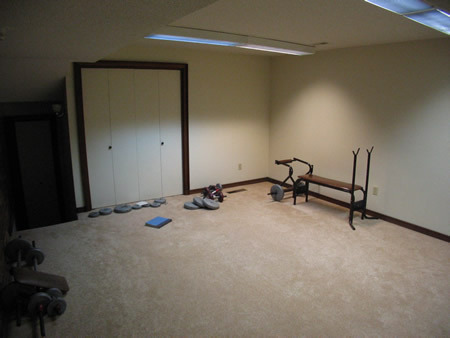 The weights and lifting bench were left by the previous owner. 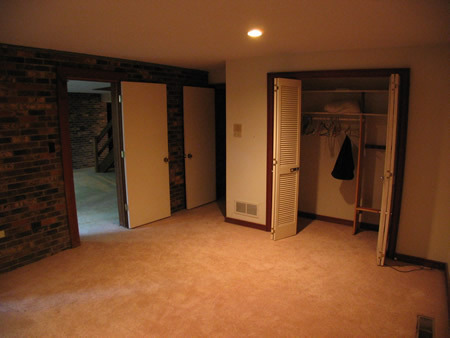 Looking at the above photo, the dark area on the left is a short staircase down to another bedroom and bathroom. This is a view from within that room of the staircase and bathroom entrance. 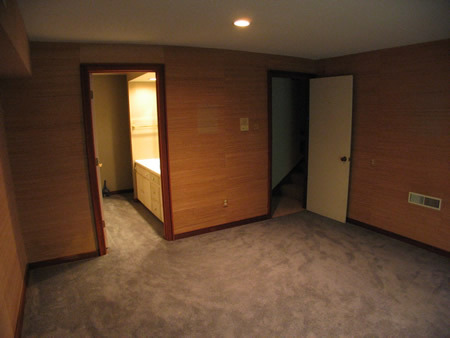 We are now directly under the master bedroom (the one with the mirrored closet doors). Looking into the bathroom (the doorway to the left), you might be able to see the corridor wraps around to the right. Around that corner is the shower and the toilet for that bathroom. 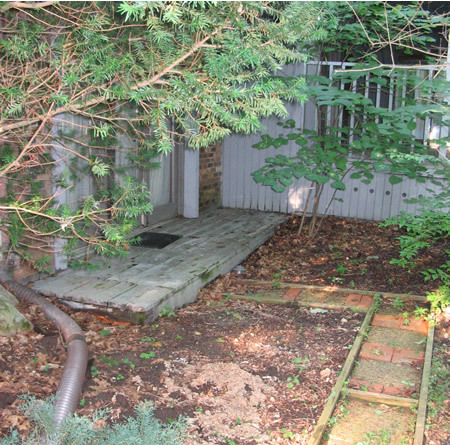 That area is probably the most remote area of the house … and wouldn’t you know it … that’s where we found Patty’s cats! Muse is the tuxedo cat. Rainbow is the calico. 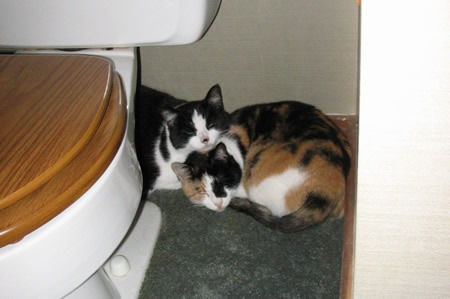 They were content to hide behind the toilet in that remote area! Stepping back into the lower bedroom, this is the view out of the room. 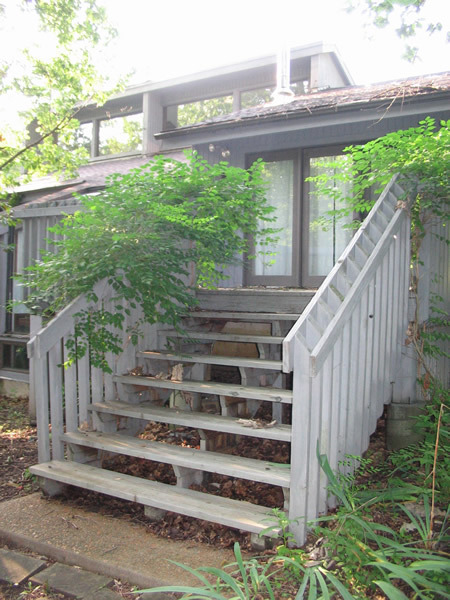 It has its own little patio and walkway out to the street. Just a few more pictures! Back in the house now, on the lower level, at the bottom of the stairs. 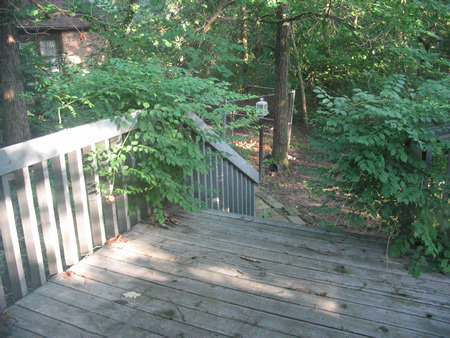 Not many pictures here, except for this one of the patio off the living-room-type area down there. 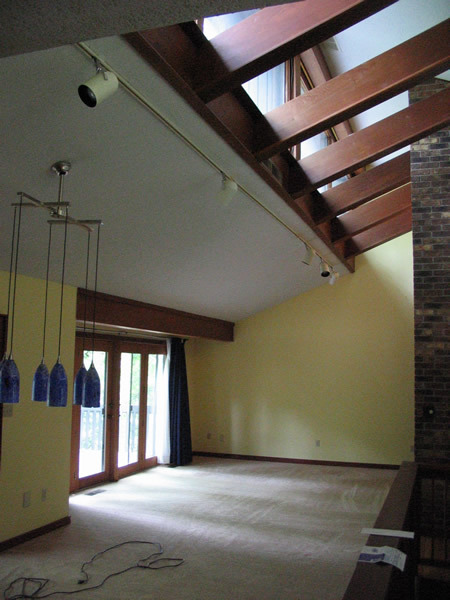 The big living area with the fireplace is directly overhead. Bruiser had a good walk! Here’s the final bedroom (#4 of 4) and it is on that lower level. This room is directly under the dining room. Through the doorway at the left, you can see the bottom of the stairway to this level of the house. 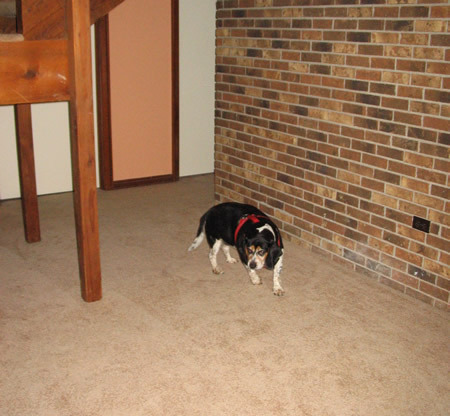 Here’s Bruiser hanging out below the stairwell! 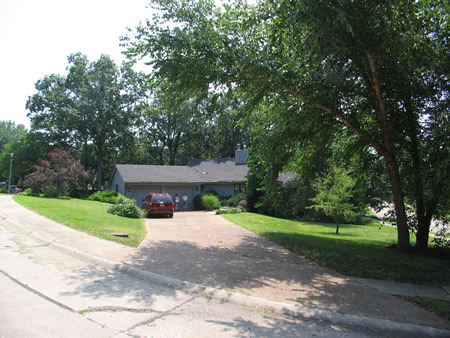 And finally … the back of the house! 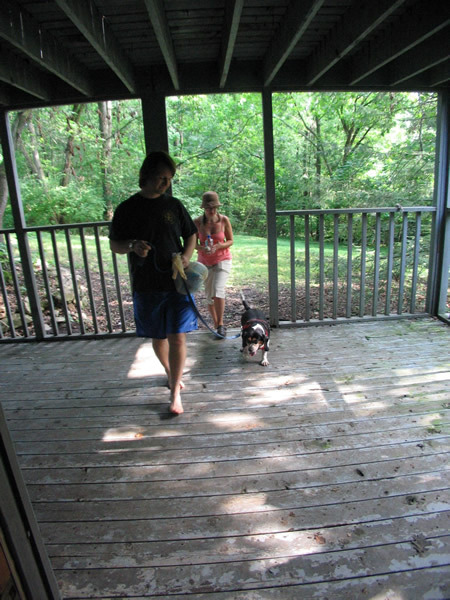 The lower level is the one pictured above with Chris and Patty walking Bruiser into the house. 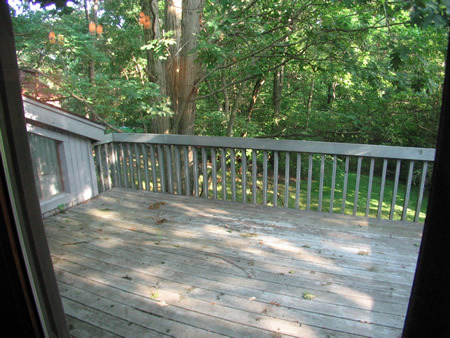 Above that is the deck off the living room with the fireplace on the first floor. There’s a “Frank Lloyd Wright retreat-house” feel to the entire home. 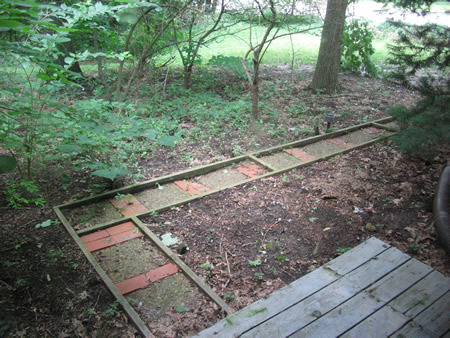 The wooded backyard adds to the ambiance! And, a final picture of Toast, one of Chris’s cats. 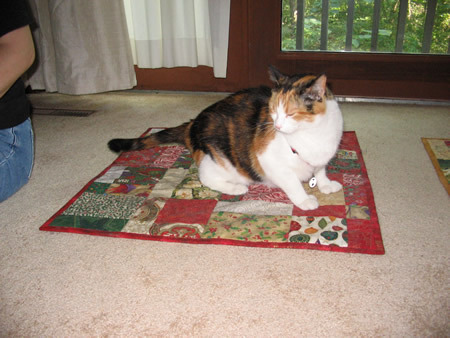 She is sitting on a “Gizzy quilt” that our cats gave to Patty’s cats for Christmas. Whew! 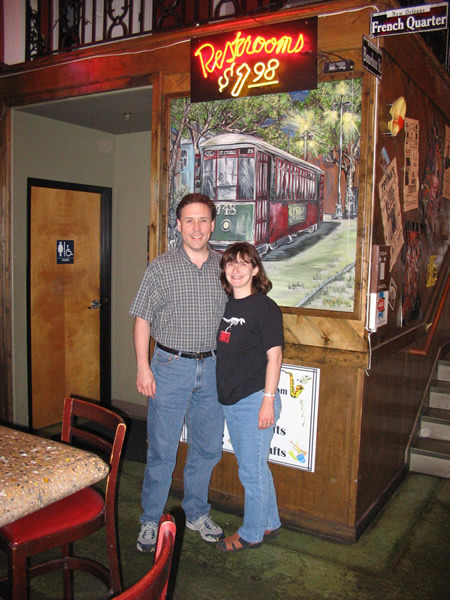 Well, with the tour of the house done, we headed out to dinner at a place called “Jazz”, a Louisiana kitchen. GREAT Louisiana-style food. Sue had a marvelous shrimp dish. The dessert pastry was a custom-made fruit filled doughnut called a “Beignet”, fresh and warm out of the oven. I had the peach and strawberry version. DIVINE! Sue had hers with chocolate and strawberries. Wow! Definitely a restaurant worth a return visit. Patty said that Chris likes pigs, so it seemed appropriate to have him and Patty pose by this piggy in the entrance to Jazz Kitchen. We stopped for a quick run of groceries and such at Schnucks Grocery, which was just around the corner from the restaurant. Then the newlyweds dropped us off at the Hampton Inn so we could turn in for the night. Overall, a fun day of sightseeing, a house tour, and good food! 2008 Missouri Trip: Day Four, Part 1: Sightseeing in Columbia, Missouri 2008 Missouri Trip: Day Five: More Sightseeing!